Error handling in SQL Server give us control over Transact-SQL code. For example when things go wrong we get a chance to do something about it and possibly make it right again. 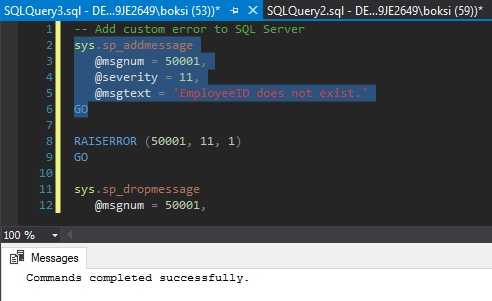 SQL Server error handling can be as simple as just logging that something happened or it could be us trying to fix an error. It can even be translating the error in SQL language because we all know how technical SQL Server error messages could get making no sense and hard to understand. Luckily we have a chance to translate those messages into something more meaningful to pass on to the users, developers, etc. In this article, we’ll take a closer look at the TRY…CATCH statement: the syntax, how it looks, how it works and what can be done when an error occurs. Furthermore, the method will be explained in a SQL Server case using a group of T-SQL statements/blocks which is basically SQL Server way of handling errors. This is a very simple, yet structured way of doing it and once you get the hang of it, can be quite helpful in many cases. On top of that, there is a RAISERROR function that can be used to generate our own custom error messages which is a great way to translate confusing error messages into something a little bit more meaningful that people would understand. Anything between the BEGIN TRY and END TRY is the code that we want to monitor for an error. So, if an error would have happened inside this TRY statement, the control would have immediately get transferred to the CATCH statement and then it would have started executing code line by line. ERROR_SEVERITY – Returns the information about anything from informational errors to errors user of DBA can fix, etc. That’s all what is needed when it comes to SQL Server error handling. Everything can be done with a simple TRY and CATCH statement and the only part when it can be tricky is when we’re dealing with transactions. Why? Because if there’s a BEGIN TRANSACTION, it always must end with a COMMIT or ROLLBACK transaction. The problem is if an error occurs after we begin but before we commit or rollback. In this particular case, there is a special function that can be used in the CATCH statement that allows checking whether a transaction is in a committable state or not which then allow us to make a decision to rollback or to commit it. We got two result grids because of two SELECT statements: the first one is 1 divided by 0 which causes the error and the second one is the transfered control that actually gave us some results. From left to right, we got ErrorNumber, ErrorState, ErrorSeverity, there is no procedure in this case (NULL), ErrorLine, and ErrorMessage. Now, let’s do something a little more meaningful. It’s a clever idea is to track these errors. Things that are error-prone should be captured anyway and at the very least logged. You can also put triggers on these logged tables and even set up an email account and get a bit creative in a way of notifying people when an error occurs. Here we have a simple identity column, followed by a username so we know who generated the error and the rest is simply the exact information from the built-in functions we listed earlier. Violation of PRIMARY KEY constraint ‘PK_Sales_1’. Cannot insert duplicate key in object ‘Sales.Sales’. The duplicate key value is (20). How this was a very artificial example but the point is that in the real world, passing invalid date is very common. For example, passing an employee ID that doesn’t exist in a case when we have a foreign key set up between the Sales table and the Employee table, meaning the Employee must exist in order to create a new record in the Sales table. This use case will cause a foreign key constraint violation. The general idea behind this is not to get the error fizzle out. We at least want to report to an individual that something went wrong and then also log it under the hood. In the real world, if there was an application relying on a stored procedure, developers would probably have SQL Server error handling coded somewhere as well because they would have known when an error occurred. This is also where it would be a clever idea to raise an error back to the user/application. This can be done by adding the RAISERROR function so we can throw our own version of the error. For example, if we know that entering an employee ID that doesn’t exist is more likely to occur, then we can do a lookup. This lookup can check if the employee ID exists and if it doesn’t then throw the exact error that occurred. Or in the worst-case scenario, if we had an unexpected error that we had no idea what it was, then we can just pass back what it was. So, if everything executes successfully inside the Begin transaction, it will insert record into Sales, and then it will Commit it. But if something goes wrong before the Commit takes place and it transfers control down to our Catch – the question is how do we know if we commit or rollback the whole thing? If the error isn’t serious, and it is in committable state, we can still commit the transaction. But if something went wrong and is in an uncommittable state, then we can rollback the transaction. This can be done by simply running and analyzing the XACT_STATE function that reports transaction state. If this count comes back as zero, that means the employee with that ID doesn’t exist. Then we can call the RAISERROR where we define a user-defined message, and furthermore our custom severity and state. So, that would be a lot easier for someone using this stored procedure to understand what the problem is rather than seeing the very technical error message that SQL throws, in this case, about the foreign key validation. With the last changes in our store procedure there also another RAISERROR in the Catch block. If another error occurred, rather than having it slip under, we can again call the RAISERROR and pass back exactly what happened. That’s why we have declared all the variables and the results of all the functions. This way it will not only get logged but also report back to the application or user. There’s a lot of them and you can see the custom one at the very top.